The secret of perfect embroidery is based on an attractive design and the right thread colors. True perfection, however involves much more than what is seen on the surface; it also depends upon the optimal combination of fabric, needle, thread and backing, as well as the ideal registration of the embroidery machine. Selecting the right supplies for your next job will be much easier if you have a clear idea of the properties of these essential products.ThreadsThere are a number of first-rate suppliers of embroidery materials around the world. These companies offer a variety of threads made of different fibres, such as Rayon, cotton, wool, polyester, polypropylene, nylon and acrylic. Regardless of your needs--whether your embroidery calls for thread resistant to abrasion, chlorine or even fading--chances are you will find exactly what you need. Rayon thread, one of the most popular, is known for its softness and sheen. It is an ideal choice for embroidering ladies, men's and children's wear, as well as trendy sportswear. But, despite Rayon's qualities, this thread is not suitable for every application. For instance, it is not recommended for blue jeans, basic sportswear or work clothes that undergo industrial laundry conditions or the addition of chlorine to the wash. For these items, polyester thread would be the better choice. If your goal is to achieve an exclusively natural look, cotton and woolen embroidery yarns are an excellent choice. Cotton threads, in particular, are very attractive when used to embellish country dècor or fashion. Woolen threads, on the other hand, have a duller visual aspect that makes them more compatible with wool, knitwear and linens. For those special projects that call for a distinctly different thread, today's digitizers/designers have technology to thank for providing them with an exciting collection of novelty threads, including both metallic and light-reactive threads. With such unique products on the market, the doors to artistic expression are wide open. The one caveat that applies to these threads is that they are not usually chlorine or abrasion-resistant, so if these criteria are of importance, polyester thread should be used instead. When creating beautiful embroidery, choosing the right backing is every bit as critical as choosing the right thread. For non-stretch materials, it is possible to use a non-woven backing without coating, while, for stretch materials, a non-woven with coating is preferred. Therefore, non-woven fabrics with coating may always be used, but their handling is more complicated and they are more expensive. It makes good sense to have a selection of white non-woven backings for sheer fabrics and black/anthracite ones for dark fabrics. Although non-woven backings are removed after the embroidery process, there might be remainders on the fabric itself, and this can have an unprofessional effect. If embroidery companies want to avoid the inconvenience of having a huge inventory of different quality non-woven backings, they should purchase non-wovens, as needed, for each order. When trying to determine the appropriate weight of backing to buy, the decisive factor is the fabric on which the non-woven backing is to be used. The rule is simple: The heavier the non-woven, the more suitable it is for heavier materials. While on the subject of backings, another product that deserves mentioning is self-adhesive backing. In addition to providing excellent stability, this product eliminates the need for hooping, making it the perfect backing for certain situations. Provided the tension on your machine is correctly regulated, bobbin thread should not appear on the right side of your embroidery. For this reason, it is not a major issue whether you use black or white thread; although, in general, it is recommended that you use a black-coloured bobbin thread for dark colours. Bobbin thread on the cone is less expensive (because someone must wind the bobbins), but, for embroidery purposes, the pre-wound variety is often preferable because its delivery is smoother. It is common knowledge that better-quality embroidery needles result in greater productivity and a higher quality of embroidery. The embroidery needle system (DB x K5) developed by Organ Needle offers some great advantages compared to the former system (287WK). Benefits include an easier and softer thread passage, less missed stitches and higher strength. 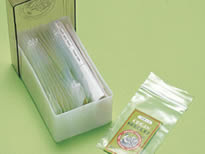 Embroidery needles with a medium ball point (SES) have the advantage that not only light fabrics, but also heavy basic fabrics, are pricked softly. Very good embroidery results can be achieved with woven fabrics and knitwear, as well as with thin leather. The needle count, or strength, is determined by the dimension of the long groove and the needle eye. A new development in needles is the DB x K5 Innova Duo system developed by Lammertz Germany with an additional groove on the furrow side, which leads to even better running properties of thethread. The new embroidery needle system is recommended for difficult embroidery designs on difficult materials, especially, when using extremely long satin stitches, or for embroidery designs with high densities. Any discussion about embroidery supplies should include temporary adhesive sprays. This useful product is one of the most important aids for embroidering large surfaces, or for using with appliquès or emblems. The decisive criterion for temporary adhesives is, of course, the gluing property. The adhesive strength should last for approximately one day, yet be easy enough to remove after sewing. Furthermore, the glue should not gum up the embroidery needles. Embroiderers looking for a way to make their designs even more expressive will have already explored the use of appliquès. The availability of materials suitable for appliquè is huge. One popular fabric is permanently coated twill, which produces quality monograms and is also suitable for embroidering logos, badges and emblems. There are so many amazing embroidery products in today's market that embroiderers will find it easier than ever to produce truly unique, beautiful embroidery. It's all a question of exploring the wealth of products out there and experimenting with them. your web site: http://www.blogger.com/comment.g?blogID=6244053764153574857&postID=7709198141541065701 to my online directory website. I used, "Blogger: Commercial Embroidery" as your weblog headline. I hope this is fine with you. If you'd like me to change the title or perhaps remove it completely, contact me at berniechisolm@gmail.com. Thanks a ton. I'll bookmark your blog and check once more here regularly. I am quite certain I will learn plenty of new stuff right here! Best of luck for the following! I'll right away grasp your rss feed as I can not in finding your e-mail subscription link or newsletter service. Do you've any? the desire?.I am trying to find things to enhance my website! I assume its good enough to use some of your ideas! Thank you for another excellent post. The place else may just anyone get that kind of information in such an ideal manner of writing?